In these lessons, students will learn how to read and respond to the text of the play. This will help them to gain crucial close-reading skills. Tasks include: actively exploring the rhythm of the play through games; finding examples of literary terms in key scenes; and performing a close-reading of Act 1, Scene 1, including the Prince's speech. Do I understand how Shakespeare’s plays are structured and organised? Do I understand the basic plot and structure of Romeo and Juliet? Do I understand how to make cuts to the text successfully? Students should turn to the Story Mountain handout in the Student Booklet. This template has five blank boxes to illustrate the structure of the five act play and five cards showing summaries of each of the five acts to arrange in the correct order. Through feedback, you could elicit students’ reasoning as to the placement of the cards in the five boxes to create the arc of the story: beginning – build-up/rising action – problem – resolution/falling action - ending. By way of an extension activity, mix in some sets of cards relating to another Shakespeare play or more than one play. Students could then compare their findings and comment on similarities and differences; this could lead to a discussion of the similarities and differences between tragedies, comedies and histories. Ask students to summarise the plot of Romeo and Juliet as a mini-saga, and share and compare students’ different versions. Which parts of the play emerge from this exercise as essential to include in their own stage production? What would the implications be of different kinds of ‘cuts’? What, as directors, would they need to bear in mind? Students could then do a dictogloss activity in groups of four. Read the following text (a short passage from a longer section on cutting the text taken from Fiona Banks’ book Creative Shakespeare) twice. The first time, students should just listen and then the second time, students should make notes as they listen. Writing a summary of the key points of Banks’ advice would be a useful resource for the next activity. Direct students to look at the Script Machine activities from the microsite 2013.playingshakespeare.org/language, and opt for ‘Director’s Edit’. Divide students into groups and allocate one of the key scenes to each group: Act 1 Scene 1, Act 2 Scene 2, Act 3 Scene 1 and Act 3 Scene 5. Students can see how the director of a real production has edited the play by cutting numerous passages. What conclusions can they draw about what has been cut and why? To what extent has Banks’ advice been heeded? Compare the following edit of Act 1 Scene 1 (cut from lines 42-101) with the original text. Everyone will need a copy, which is included in the Student Booklet. Prepare a performance of this edit involving the whole class. MONTAGUE 1: Do you bite your thumb sir? CAPULET 1: I do bite my thumb, sir. MONTAGUE 2&3: Do you bite your thumb at us sir? CAPULET 1: Is the law on our side if I say ay? CAPULET 3: But I bite my thumb, sir. CAPULET 4: Do you quarrel, sir? MONTAGUE 4: Quarrel sir? No, sir. CAPULET 5: I serve as good a man as you. CAPULET 6: Draw if you be men! TYBALT: Turn thee, Benvolio, look upon they death. BENVOLIO: I do but keep the peace. MONTAGUES: Down with the Capulets! Down with the Capulets! CAPULETS: Down with the Montagues! Down with the Montagues! Encourage students to reflect on how well this edit worked as a piece of storytelling and as a piece of theatre. What are the main events in the story of Romeo and Juliet? What would audiences most enjoy about a production of Romeo and Juliet? Where would I decide to put the interval and why? Encourage students to think about what they as an audience member most enjoy about going to see a Shakespeare play/or Romeo and Juliet specifically. They should distill their thoughts so they are left with just five points, e.g. Compare students’ different ideas and identify any common themes emerging. This quiz about the story line of Romeo and Juliet could be a useful tool for consolidating textual knowledge, for retrieving information from the text and for revision purposes. The questions are available in the Student Booklet, and the answers are available in the downloadable Lesson Plans at the bottom of this page. Where in present-day Italy does the play take place and who is its ruler? Who is the first speaker in the play, and how many appearances does this speaker make? What is the name of the two feuding households? How old is Juliet and how do we know? Is Rosaline related to the Montague or Capulet family? Who is it intended that Juliet should marry? Who are Anthony and Potpan? What do Romeo and Juliet do at the end of the sonnet formed by the first words they speak to each other? 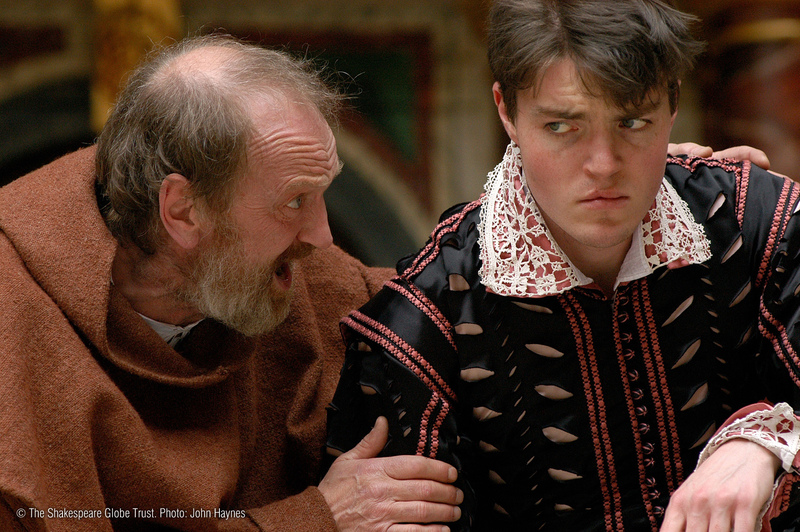 Is it Romeo or Juliet who says ‘Deny thy father and refuse thy name’? Is it Romeo or Juliet who says ‘What light through yonder window breaks’? Which two characters agree to help Romeo and Juliet marry? Why is Romeo and Juliet’s marriage unlawful? Who is fatally wounded by Tybalt in Act 3 Scene 1? Who kills Tybalt in Act 3 Scene 1? Where is Romeo banished to? What object does the Nurse bring to Romeo in Act 3 Scene 3? What is Capulet talking about when he tells Paris ‘A Thursday let it be’? What is in the ‘vial’ that Friar Laurence gives Juliet in Act 4 Scene 1? For how long are its effects felt? At the end of which scene does Juliet drink the contents of the vial? Why does ‘festival’ turn to ‘black funeral’ in the Capulet household? Why doesn’t Friar Laurence’s message reach Romeo? Where does the final scene of the play take place? What happens to Paris at the end of the play? How do the two lovers kill themselves? Who gives Prince Escalus the letter than explains the events leading to Romeo’s suicide? Some excellent resources to support students’ understanding of and engagement with the play’s storyline are Anna Claybourne’s Short Sharp Shakespeare: Romeo and Juliet, Michael Cox’s modernised prose retelling, and the three differentiated graphic novel versions of the play (quick text, plain text, original text) produced by Classical Comics. There are further activities relating to genre within the Key Stage 4/5 materials on this play under Themes. Can I reflect on my past experiences and confidence levels in relation to speaking and understanding Shakespeare’s language? Can I try out a range of rehearsal room strategies for developing my skills and confidence in relation to Shakespeare’s language? Can I reflect on my progress and set myself targets? Each student should have a few sticky notes, in two different colours. They should write down positive words and phrases about working with Shakespeare’s language on notes of one colour, and any words and phrases about the difficulties of working with Shakespeare’s language on notes of the other colour. Students could then be asked to stand by the quotation they most agree/identify with. Take some feedback. Support the class in collating these into a simple table of two columns or in a slightly more advanced SWOT analysis table (strengths, weaknesses, opportunities, threats). Summarise key findings and stress that the approaches the class will be using are active and fun! But soft, what light through yonder window breaks? O Romeo, Romeo, wherefore art thou Romeo? They have made worms’ meat of me. I have it. Hang thee, young baggage, disobedient wretch! For never was a story of more woe,/Than this of Juliet and her Romeo. 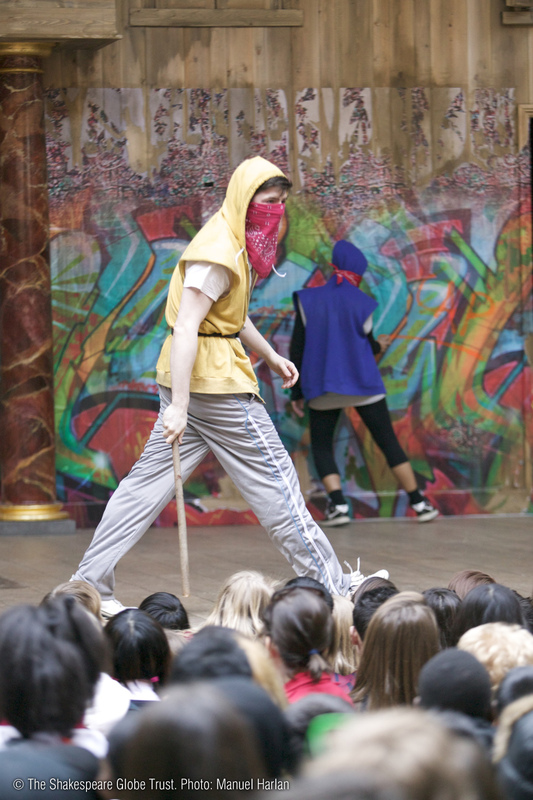 There are many drama activities that can support students’ confidence with reading and speaking Shakespeare’s verse and developing an understanding of metre, e.g. Whether students attempt one or more of these, students’ reflections during and after each activity will support their knowledge, understanding and confidence about applying these insights in practice. A ‘Rehearsal Diary’ section of the Student Booklet is provided for this purpose. Divide students into groups and assign each group of students an extract, e.g. Q) How many characters are present in this scene? Would you call this scene public or private? Q) How many speakers are there? Who are they? How well do they know each other? What is their relationship? Q) What are the characters speaking about? Q) What does each character want in this scene? What is motivating each character to behave and speak as they do? What barriers or challenges can readers and performers of Shakespeare encounter? What knowledge and skills can I bring to reading and performing Shakespeare to help me bring the language to life? Students could write advice for a class of students (perhaps from a younger age group) who will be studying Shakespeare for the first time. David and Ben Crystal’s Oxford Illustrated Shakespeare Dictionary contains over 4000 Shakespearean words with examples from the twelve most studied plays including Romeo and Juliet. This matching activity will support students’ understanding of some words from the play that we don’t use in modern English though some have developed into words we know today. This is provided in the Student Booklet and in the Modern Meanings PowerPoint. Students might like to try this matching activity to support their understanding of the language of Romeo and Juliet. All of these italicized words look reasonably straightforward for 21st century readers. But what exactly do they mean in the play? This is provided in the Student Booklet and in the Modern Meanings PowerPoint. Students should reflect on the clues they used to help them in this activity, including analysing the word itself and considering the word in context. They could also devise their own matching activity, e.g. to support their understanding of a particular scene. Having answered the questions for Activity 3, students could then annotate the scene with directions for the actors playing each part. This could be an extension or homework activity and could be the basis of an assessment task. Can I identify passages written in verse and passages written in prose? Can I find examples of language techniques and comment on their effect? ideas about when Shakespeare uses verse and when he uses prose, i.e. is it about subject matter? Character? Situation? Status? 1) Text detectives: verse or prose? For this close reading activity, a scene which features passages in both verse and prose is necessary. An extract from Act 1 Scene 1 of Romeo and Juliet would work very well, e.g. lines 18-101. The scene should be broken down into three chunks of 25-30 lines each. You should model close reading and analysis of the section labelled A. Be very explicit about the questions you are asking as you explore the text, and what you notice about the use of verse and prose. Support students who now work in pairs, applying the same questions to the section labelled B. Finally, pairs should merge to make groups of four who apply what they have learned to a close reading and analysis of the section labelled C.
Alternatively, Act 2 Scenes 4 and 5 would also work well for this activity. What different effects are being created? 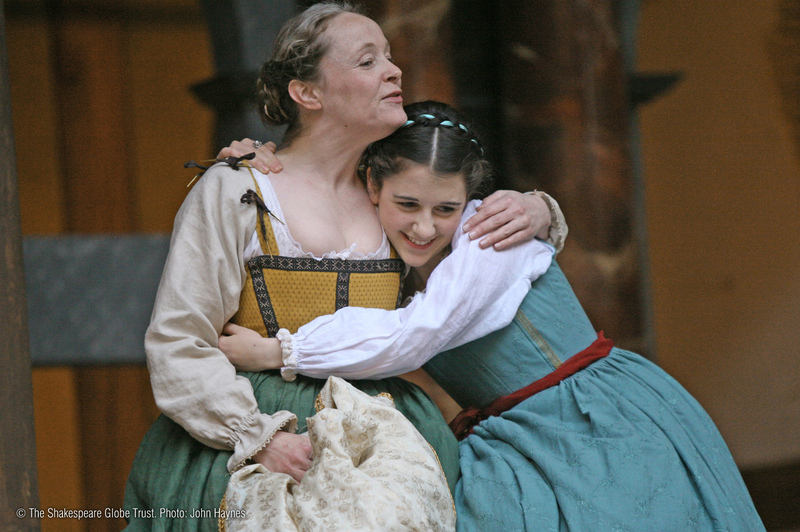 How does Shakespeare convey the Nurse’s style of speaking and personality in these extracts? For this activity, students need access to the script machines (2013.playingshakespeare.org/language). They should access this on five different screens, e.g. on tablets or laptops or at five different stations in a computer room. Students need to work in groups and each group should be assigned one of these five features or pair of features: alliteration and assonance; onomatopoeia; repetition/lists; rhyme/rhyming couplet; similes/metaphors/imagery. The Aside activity provided on this page can be used to assist students in revising these terms if necessary. Groups should move in a carousel, visiting each scene and using the Script Machine feature to identify examples of their particular feature or features. (The scenes are Act 1 Scene 1, Act 2 Scene 2, Act 3 Scene 1 and Act 3 Scene 5). Now allocate to each group of students one of the scenes and ask them to carefully read that scene in its entirety. Students should move their discussions on to the effect of the techniques used in the context of the particular scene. Shakespeare wrote his plays to be heard. What kinds of effects might Shakespeare’s language choices have on me as an audience member? What is Shakespeare able to convey about a character through the rhythms of their speech? Pick an example of a technique from a particular passage and explain its effect. Use the ‘pose – probe – bounce’ technique to help students extend their answers and build on each other’s answers. Students could look for examples in the following quotations of language techniques: alliteration, assonance, onomatopoeia, rhyming couplet, repetition, simile, metaphor. This activity is provided in the Student Booklet and in the Literary Terms PowerPoint. This but begins the woe others must end. And may not wear them. Love is a smoke made with the fume of sighs. Student could log their ideas about acting particular scenes and playing particular characters in the Rehearsal Diary pages of the Student Booklet. This could be the basis for an assessed piece of work.